I currently have several ever-present struggles that I have been fretting over. One is the state of my milk supply. I have been pumping milk from a hospital-grade rented pump since the second day of my daughter's birth. The expressed amount has varied greatly from day to day and week to week. I've read all the dos and don'ts of maintaining a milk supply. Applying those words simultaneously is tricky. I'm forgetful. I focus on feeding the baby and forget to get myself a drink of water. Last week, I got a low-dosage presecription for Domperidone, a milk supply enhancer. I upped the dosage amount after three different sources(the pharmacist, an online article recommending the drug, and the occupational therapist)all stated independent of one another that normally the dosage is higher. There is controversary around the drug's results and side effects. As for me, I have yet to see any discernable difference when I pump or in the feel of my breasts. So I don't plan on finishing the pills. Apparently the best cure is another area of struggling for me. Breastfeeding my baby. Because she had difficulty sucking milk and staying awake to breastfeed or bottlefeed, Baby K needed a feeding tube. 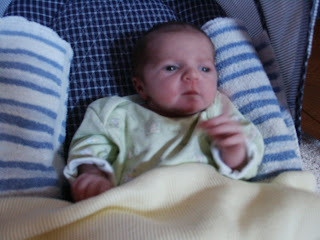 The criteria for her to leave the children's hospital was 2-3 days of consistent and complete bottlefeeding. She had to take the whole amount prescribed by bottle in a set amount of time. It was a great schedule and we rejoiced the day that she was discharged. Since then, the occupational therapist(OT) and a registered dietition(RD) have been coming regularly to my home to assess the baby's growth and provide support for the feeds. Both women have been extremely helpful and knowledgeable in their respective areas. I have learned much from their visits. Now we are working on teaching Baby K to breastfeed, even if it is for only a few times a day. It is hard work. I want to stop pumping, yet she is not consistently willing to breastfeed. She fusses much at the breast and even yells in anger at times. I can share the OT's very insightful suggestions in another post as there is much to say. Feeding the baby throughout the day and night brings me to my next struggle. My housekeeping. I can't get it together and while I know that some things are just going to have to wait, it is so, so hard to let messes be. I'm not an organizational guru. But I do like to bring order to disorderly areas. And it pains me to see so many areas neglected for days and now weeks on end. Meals, laundry and big brother are the three areas that need to be kept up. All three are time consuming, yet very rewarding, albeit necessary. I am constantly, constantly thinking about what I am going to do and when. I have never had so many plans slip through my fingers so much of the time, which brings me to the last area of struggle. Our cat. For months, I have been planning on how to deal with her naughty and often unfriendly behavior. She is a year and a half old and thoughts of ending her short life come to me more frequently now. She will not leave our kids' toys alone. She steals them and takes them to her lair, which is the laundry room(another untidy area). I put things out of her way, yet she consistently hunts them down and drags them away. She hisses at all of our son's little friends, who have yet to be found provoking her. She also hisses at some adults who try to befriend her. To us, she is loving and normal. She is fine with the kids and plays very gently with our son. We had her declawed and she is exclusively an indoor cat. I am tired of needing to cover up, stash away, or hide our family's toys. I'm tired of disciplining her over and over and over. Last night, she jumped up on top of a bookcase in the basement, knocking down a small mirror that has been propped up there for months as different ones have slept down there. She was after a small round wooden piece that came off my son's toy fire truck. I have found it repeatedly on the floor and last night, she jumped up on the shelf, intent on getting it again. This morning, I had murderous thoughts about her and was contemplating a call to vet to discuss the issues at hand. We can try to find another home for her, but I would feel bad if she hissed, stole, and broke things with another family. It is not easy to find a new home for cats. There are many, many cats and kittens who are up for new adopting homes. So the struggle continues. But one idea has been penetrating these troublesome thoughts. Tell it to the Lord. I need to keep reminding myself that the Lord is my constant guide. He is the sole expert in all areas and struggles of my life. He gives wisdom to those that seek it and patient endurance to those who cast themselves upon Him. Praying through these current struggles is calming as I wait expectantly for Him to strengthen me by His glorious might. He is the Expert of all experts. He is my refuge and shelter from all life's struggles. Why do I forget Him and only remember to get help from others? I am so ready for some local "global warming". But I do love seeing these two working outside together. I wish I could do it all! But since I can't, my blogging efforts have been the first to fall by the wayside. But I'm here right now, so let me briefly say, Baby is doing very well. She is now over the 7 lb. mark and is filling out in her face and tummy. She is on the verge of intentionally smiling and is growng some new fuzz on her head. We think she's adorable. Her big brother is working hard on his phonics, learning to sound out words and read short sentences. I hope to post more about the phonics program that I am using with him. Today I was teaching him how to play Uno, as he has already mastered other games like Chutes & Ladders, Guess Who and Junior Scrabble. We also play a easy version of Mastermind which in its original rules is quite challenging. Keeping the house clean for more than 24 hours has proven to be impossible. I have no idea where the mess comes from exactly, but it arrives and obstinately refuses to leave! Oh dear. Today my husband is painting our front door entryway. Long ago, I mentioned posting pics of our house, well perhaps with more paint on the walls I can take some pics to show the areas that have been worked on. Maybe, just maybe.